door to door cupcakes: the baking couple who deliver sweet treats direct to city offices. 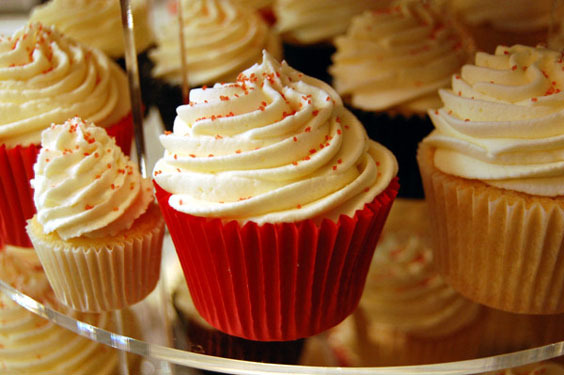 Just like following Hansel and Gretel's trail of crumbs, office workers in need of a sugar hit can now go online to track the progress of a man delivering cakes across Derby. Tony Jacobs visits offices with a wicker basket full of cupcakes and other sweet treats made by his wife, Victoria, that are for sale. And people can find out his location by logging on to the couple's website and looking at an interactive map tracking his progress. 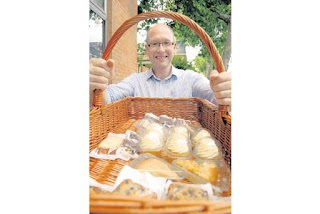 Tony, 43, who delivers the cakes while Victoria, 39, spends the day baking, said: "Our specialities are traditional cakes like Victoria sponges and lemon drizzle cakes, but we've noticed cupcakes are becoming more popular. "We like to keep it simple by doing three flavours and doing them well. We make hundreds of cakes a week in the flavours of vanilla, lemon and Belgian chocolate." The couple, of Friar Gate, set up their company, Love Cakes, last year and began selling their bakery treats at Chesterfield market. But their products have proved so popular that they no longer have time to run the stall, instead concentrating on orders and deliveries. They pride themselves on natural British ingredients and do not use food colouring or any decorations that do not meet these requirements. They use natural sugar sprinkles, homemade jams, get their eggs from Highfield Happy Hens in Etwall and fruit from Ted Corden's grocery in Derby Market Hall. Tony said: "The other day we took an order for 18th birthday cupcakes with a homemade sugar photograph of the lad on his first day at school. We also once we had an order for 400 vanilla cupcakes and did them in the charity's colours. That was definitely an all-nighter." They have a popular lime and coconut cake and their newest invention is Dancing Duck beer loaf cake, handmade with ale from Derby's Dancing Duck Brewery in Ashbourne Road. This week their cake basket included Belgian chocolate loaf cake, apple and almond cake and vanilla cupcakes. They also provide petit fours for the Mansion restaurant, in Midland Road, and take large orders for birthdays and weddings. Much of their popularity has been through word of mouth and social networking site Twitter. Tony said: "The amazing responses we get from around Derby always bring a smile. Victoria really has a passion for baking cakes and it really shows through in her little masterpieces."